It's Saturday...woo hoo! Today I wanted to share my newest layout for Hip Kit Club. This is my first page using the new 2018 October Hip Kits, and they are soooo pretty! They're full of the new Paige Evans Whimsical collection, and I couldn't wait to tear into it. Our theme this week is All About You, so I created this fun layout about me and my love for scrapbooking. The Whimsical line has a lot of cute little crafty icons, so it was perfect. I started by fussy cutting the large flower cluster from a patterned paper and then went on to cut out several of the fun phrase banner pieces. I used white cardstock as my background (from the Cardstock Kit) and used a brayer to roll on lots of color. I used all three Shimmerz Paints from the Color Kit as well as a few more from previous kits. A brayer is a great way to smudge down color, and you don't even need gesso to get this effect. Look at all these fun phrases! I think all of us scrapbookers will love this because every one of these statements fits us, right?! I used some of the stickers from the Whimsical Sticker Book here...those little scissors are so cute! I also used some flowers, leaves, buttons, and even a little glue bottle. I did add some stitching in coordinating colors here and there. I also added in some of the Whimsical Die Cut Flowers and some of the Puffy Stickers...those tiny clouds! Here you can also see where I added some adhesive foam underneath the big flower/leaf cluster to give it some dimension. No messy mixed media layout is complete without splatters, right? I added in a few of the Whimiscal Rub-Ons, and they went on like butter! I used some white thread to stitch some butterfly trails from the bigger butterflies. Here you can see how cool the background color looks from using the brayer. You really can't mess it up. I used some of the Whimsical Mini Thickers here...they're rainbow and as adorable as can be! I really love the Thickers we get in the Main Kit. This "create" piece was perfect for this, and I just love the font and color. 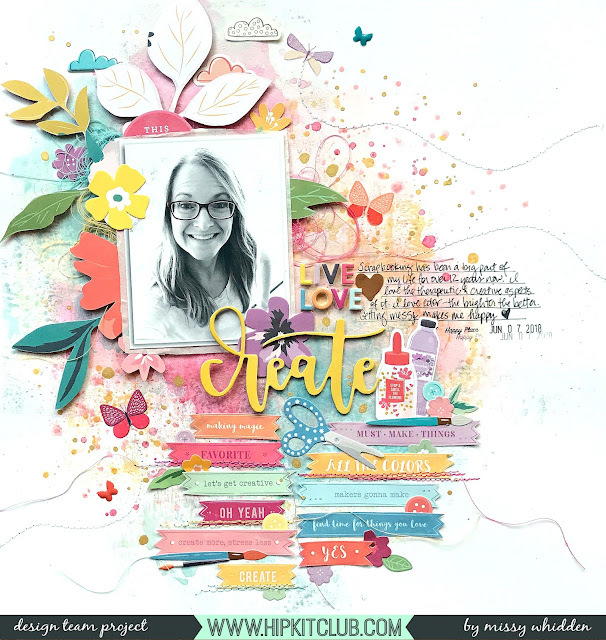 I hope this inspires you to create a layout about your favorite hobby, which is probably scrapbooking, right? This was so fun to make...all the pieces about this hobby are just awesome. I have a process video here if you'd like to watch. What a gorgeous layout! I stumbled upon this from the Altenew blog hop you took part in. I just signed up for my first HKC subscription and can't wait to get the November box! Can you tell me when they typically ship out each month? I'm super excited to get started.